Veggie of the week: pachyrhizus erosus or jicama. 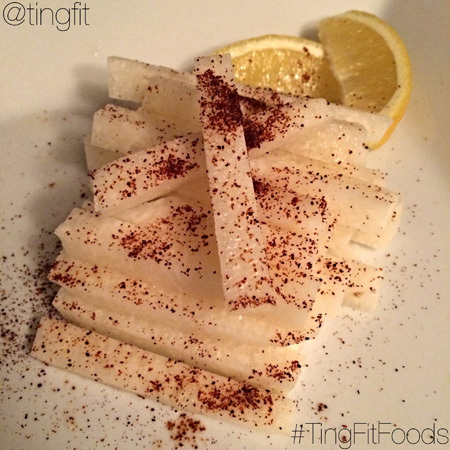 Jicama is also know as the Mexican yam, Mexican turnip, and is something referred to as yam bean as well. In the recipe below, I’ve featured the plant’s tuberous root. I love eating it raw with fresh lemon or lime juice and chili powder. It has a crisp texture to it and is very refreshing to eat in the summer due to it high water content. It’s texture and juiciness is comparable to that of a pear. It makes for an excellent snack and a great alternative to munching on a bag of tortilla chips when you pair it with salsa or fresh pico de gallo. 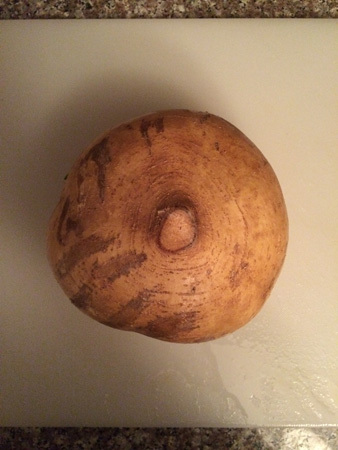 More information on jicama. Jicama is a powerful antioxidant with almost no fat, low sodium, is high in fiber, and vitamin C. It’s good for reducing fever, cholesterol levels, and stomach acid production. As with other fruit and vegetables that are a good source for vitamin C, it’s also great for boosting the immune system. Jicama is commonly eaten raw with a variety of seasoning and condiments such as ground red pepper, rice vinegar, salsa, salt, lemon and similar ingredients you would find in salsa. It is pretty commonly eaten in Mexico and Spaniards spread cultivation into the Phililppines, which then made its way throughout Asia. Cut into rectangular, bite-sized pieces.